Google Classroom is used at Locust Grove as a learning management system to house relevant coursework for participating classes, including announcements, important links, personalized Learner Pathways, and assignments. With the 1:1 Devices initiative, teachers are able to push for all coursework to happen online, building students’ digital competencies and taking advantage of the collaborative features with Google Classroom. 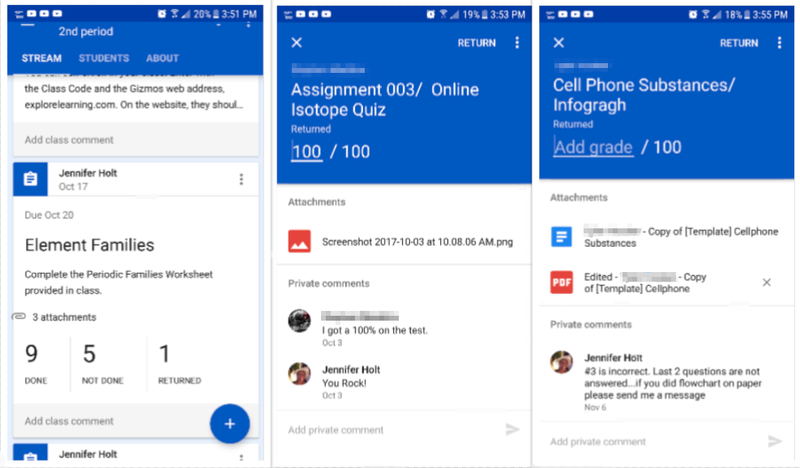 Teachers also leverage Google Classroom to “conference” and share feedback with students, access students’ online work and have discussions through the comments feature. After students submit assignments, teachers can share feedback and return the assignment, allowing students to revise and improve their work before resubmitting. Accesses information and works through assignments in Google Classroom. Asks questions and responds to teachers through Google Drive commenting. Provides feedback to others students using feedback protocols. Posts information and assignments in Google Classroom. Asks questions, provides feedback, and responds to students through Google Drive commenting. Reviews completed work in Google Classroom and returns to student, if needed. Organizes and stores online assignments and content. Facilitates online collaboration and feedback through easy sharing of documents and commenting features.